PENNINGTON COUNTY, SD – The Pennington County Sheriff’s Office is gathering resources from around the region to look for Serenity Dennard, last seen Sunday, February 3, 2019, near the Black Hills Children’s Home in Rockerville. Over the weekend, seven specialized scent and cadaver dogs and their K-9 handlers from South Dakota, Iowa, Wyoming and Colorado will be looking for the missing nine year old. 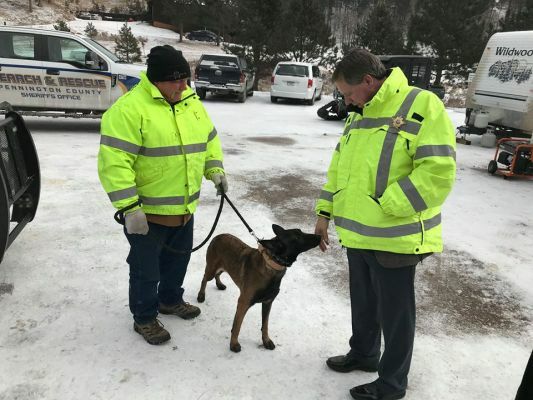 The dog teams will set up in the Black Hills Children’s Home parking lot at 7 am Saturday and Sunday and hope to be searching the area from 7:30 am until 5 pm each day. Given the snow and cold, the dogs will be shuttled back and forth from the parking lot all day to stay warm and rested. Rushmore Helicopters owned by Mike Jacobs will by flying with two spotters from the Pennington County Sheriff’s Office. They will expand the search from the air. The helicopter will start the search at 9 am Saturday and Sunday from a field turned into a landing pad at the Black Hills Children’s home. They hope to fly roughly five hours each day depending on the weather and cloud cover. Whelchel will be available for the media on Saturday at 10 am and Sunday at 2 pm. Serenity Dennard is described as a Caucasian female, 4 foot 9 inches, 90-100 pounds, with blue eyes and shoulder length dark blonde hair. She was last seen Sunday at 11 am on South Rockerville Road wearing only a long sleeved grey shirt with flowers, blue jeans and snow boots. She had no coat at the time she left the Black Hills Children’s Home. Finding Serenity remains a top priority of the Pennington County Sheriff’s Office. We have an active investigation with investigators from the Sheriff’s Office and detectives from the Police Department dedicated to following up on all leads. If anyone has seen or had contact with Serenity, do not communicate that information via social media. Please contact the Pennington County Sheriff’s Office at (605) 394-6115.